It happens very often that a new job vacancy is somewhat related to an older (or existing) job vacancy of the organisation. Possible explanations for this relation are the fact that candidates may leave the organisation after a while (so organisations need to re-post that job), organisations might search for the same job profiles in different regions or organisations can be expanding and might need a second employee for a specific function. In case this happens, the new job will show similarities with an older job. To prevent the recruiter from having to re-type the job requirements, job profile, contact details, etc. for every related job, the application provides the opportunity to create job templates. After creation of a job based on a job template, it is possible to adjust these sections to the specific needs for that job. In this way, the default template saves a lot of time in typing text and adding criteria or questions, but still offers a possibility to adjust to the situation. For example, when a job is created for an administrative worker in two regions, a job template can make sure that most of the job does only need to be typed and selected once. The differences for the specific regions can be adjusted per job. A possible job template (Software engineer) can look like as shown below. As can be seen at the top of the image, it is also possible to access the job template translations, hard criteria and pre-screening questions from this page. The last section of this article provides information on how a job template like this one can be used in the application. Click here to proceed to that section. How to configure a job template? Open the tab "Connexys Resource Manager Setup" that can be found under the plus (+) on the bar at the top of the screen. Select "Job templates", which can be found under "Basic setup". Click the button "New Job template". The first step in the creation of a new job template is filling the fields "Job title", "Job description text", "Job requirements text" and "Compensation and benefits text". Job template: Select the template to which the pre-screening has to be linked. When this screen is accessed from the button as described above, this field will automatically be filled with the job template that was worked in. Pre-screening question: Choose the pre-screening question that needs to be added to this job template. Make sure this pre-screening question is already created in the configuration-section on pre-screening questions, because only existing pre-screening questions can be linked. It is not possible to create new pre-screening questions from this place in the application. For more information on pre-screening questions, read the article here. Knock-out: Determine whether this is a knock-out question. If so, a negative answer to this question, will lead to a negative overall score. If not, a candidate can still score positive based on answers to other questions. Weight: Provide a number that determines the weight of this question. The higher the number, the more important the answer to this question is in relation to the other pre-screening questions. Order: Give a number to indicate on which place in the list of pre-screening questions this question should be placed. The number 1 will result in the question being placed at the top of the section. Tip: do not use the numbers 1,2,3,etc., but use 10,20,30, etc. This gives the possibility to place a pre-screening question between two others at a later time. Applies to all jobs: Check this box if this pre-screening question should be added to all job templates. Select the option Job template in the question which Record Type the new record (Hard criterium) should get and press "Continue". Fill the three (3) fields that are given. Notice that the user will automatically be the owner of the new hard criterium for the job template. Job template: Select the job template to which the hard criterium should be linked. When this screen is accessed from the button as described above, this field will automatically be filled with the job template that was worked in. Hard criterium value: Choose the hard criterium value that has to be linked to this job template. For example, Mid-career (3-5 yrs) from the Hard criterium "Career level". Note: just as for pre-screening questions, a hard criterium value already has to exist and can't be created from this screen. For more information on how to create hard criteria, read this article. Weight: Determine the weight that this hard criterium should have. The higher the number, the more important this hard criterium is in comparison to other hard criteria in this job template. Click "Save" to add the new hard criterium to the job template. Job template: Select the job template for which a translation has to be made. When this screen is accessed from the button as described above, this field will automatically be filled with the job template that was worked in. Language: Choose the language of the translation. Job description text: Write the translated text of the job description in this field. Job requirements text: Write the translated text of the job requirements in this field. Compensation and benefits text: Write the translated text of the compensation and benefits in this field. After all these steps have been taken, the job template is ready and can be used for creation of new jobs. A further explanation on where these job templates are used is provided in the next section of this article. How to make use of job templates? A job template has one function, which is being used for the creation of a new job in the application. The job template makes sure that a user does not have to put time and effort in creating a practically identical job at a later point in time. By use of a job template, the basic fields of a job (optionally including hard criteria, pre-screening questions and translations) are automatically filled when a job is created. Creation of a new job can be done in two ways, which is expressed in the following screenshot. The red blocks indicate the ways in which a new job can be created. The first option to create a new job is by clicking on the drop-down list under "Create New..." at the left side of the screen. The drop-down list includes an option "Job", which will bring the user to the screen that is given in the screenshot below. Another option is by opening the "Jobs"-tab in the bar on the top of the screen. This opens the tab as given in the screenshot above. The red block in the middle of the screen stating "New" also brings the user to the screenshot that is shown below. 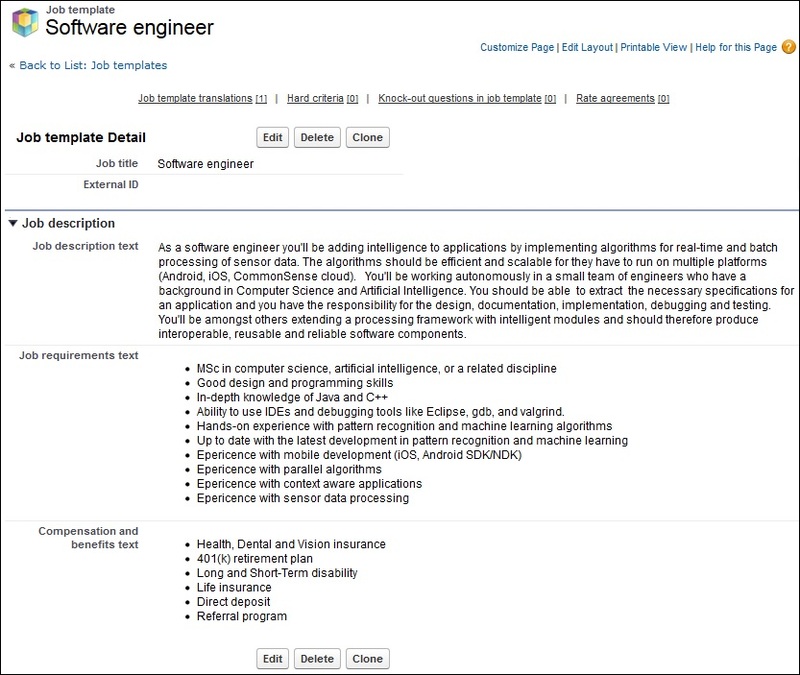 In the screen that is shown in this screenshot, the user can select the job template that includes the basic information for the new job. Furthermore, the user needs to select for which "Department / customer" this new job should be created. When a job template is filled and the button "Next" is clicked on, the basic fields for the job will automatically be filled. For more information on the creation of new jobs, the article on "Jobs" can be read.